Every fall, thousands of people from all over the country travel to Northwest Arkansas for incredible views of the Ozarks, award-winning food, and the world's largest charity motorcycle rally. Bikes, Blues and BBQ revved up about 18 years ago with a mission to support women, children and the underserved members of the Northwest Arkansas community. To date, the rally has raised more than $2 million for local charities. It's an event that not only serves a great cause, but also helps bust some myths about the motorcycle subculture. They've created a family friendly atmosphere, inclusive to all members of the public. They don't allow racism, white supremacy, bigotry, fascism, intolerance or hate speech in any shape or form. 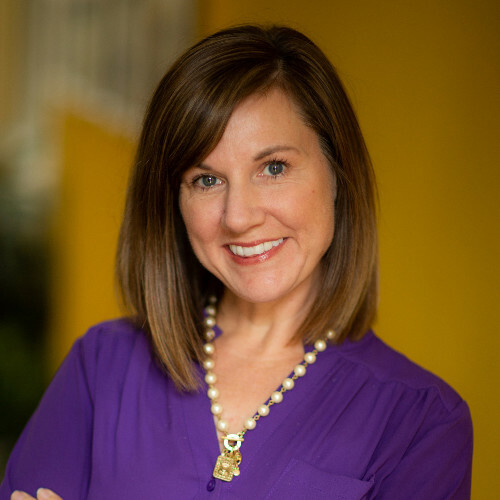 Being such a standup event, the organizers wanted their online experience to be just as friendly and accommodating. They also needed it to be informative and easy to navigate. With a growing number of new riders each year, many times the website is someone's first encounter with the event. 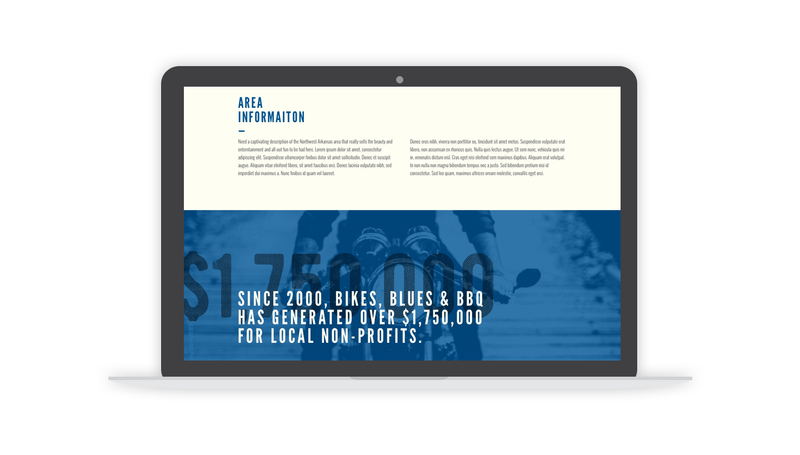 While Bikes, Blues and BBQ had an existing website, it was created several years ago. It was built on Wordpress, which caused problems for them as they grew. The design was outdated, and it became hard to navigate. Many sections had been added over time, causing it to get bloated with excessive content or information that wasn't easy to find. It was definitely time for an overhaul. That's when we stepped in. Our primary goal was to improve the user experience and distill the site down to the most useful information. 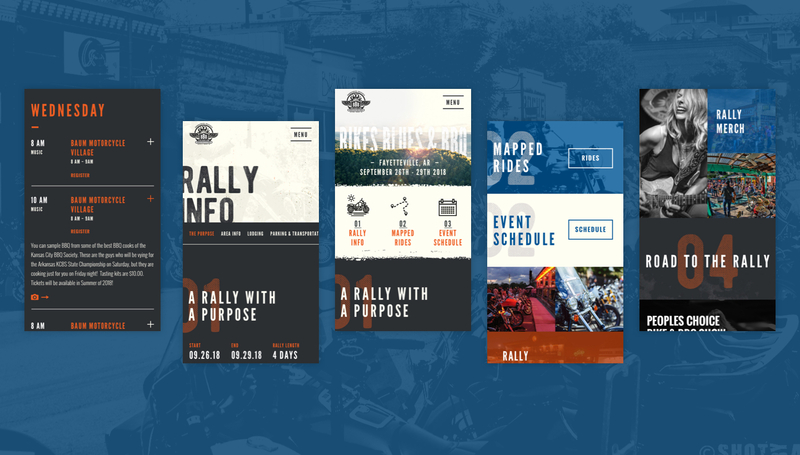 We wanted the riders to be able to quickly find the important stuff, like the schedule, ride maps and rally information, while also having the opportunity to dive into deeper topics, if they wished. So, we prioritized content and narrowed the navigation to a more manageable and organized list. Then we used the Matchstick Framework to build the site, which allows for easy customization, better SEO opportunities, and more flexibility down the road. The design direction was twofold. First, we wanted to show off the beauty of the Ozarks to give people a sense of the scenery and laid-back vibe of the area. We also wanted to create a highly modern, mobile-first experience. Drawing inspiration from other large-scale arts and music festivals from around the world, we were able to design a site that exceeded everyone's expectations. The board of directors was especially thrilled with the outcome and feel like we created an experience that's streamlined, easier to use, and true to the friendly, inclusive spirit of the rally. 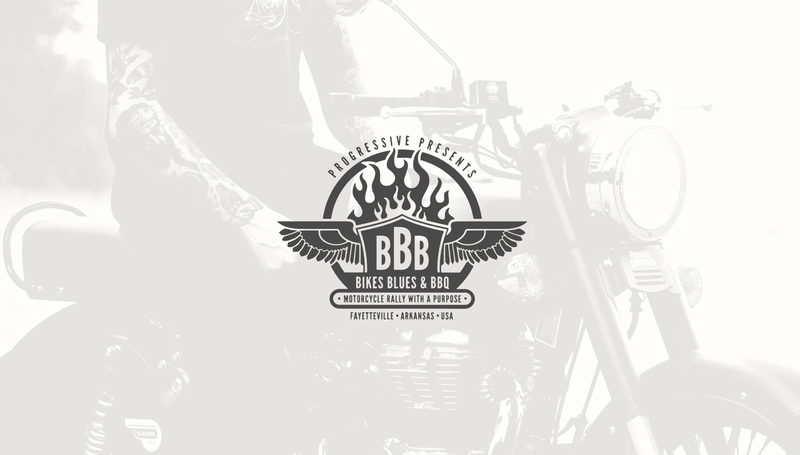 If you haven't had a chance to attend Bikes, Blues and BBQ, be sure to check it out this September. You can find all of the details on their new site.